In this picture, the spectacularly symmetrical wings of Hen 2-437 show up in a magnificent icy blue hue. 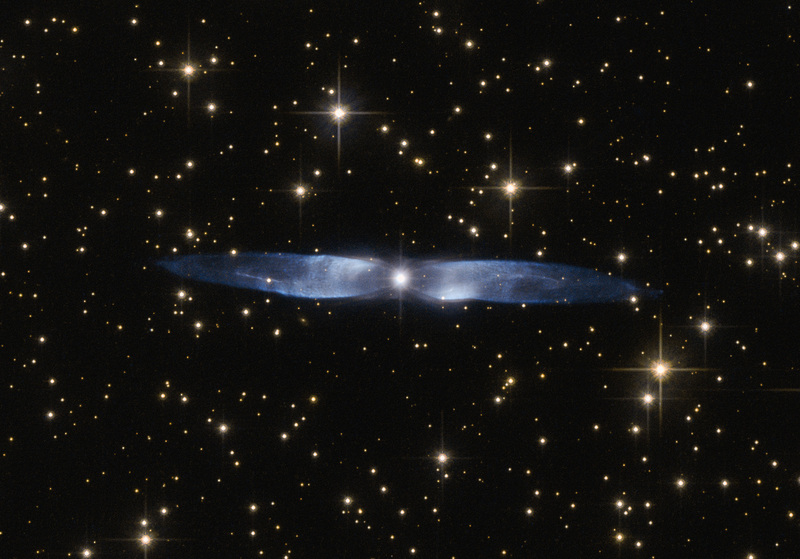 Hen 2-437 is a planetary nebula, one of around 3000 such objects known to reside within the Milky Way. Located within the faint northern constellation of Vulpecula (The Fox), Hen 2-437 was first identified in 1946 byRudolph Minkowski, who later also discovered the famous and equally beautiful M2-9 (otherwise known as theTwin Jet Nebula). Hen 2-437 was added to a catalogue of planetary nebula over two decades later by astronomer and NASA astronaut Karl Gordon Henize. Planetary nebulae such as Hen 2-437 form when an aging low-mass star — such as the Sun — reaches the final stages of life. The star swells to become a red giant, before casting off its gaseous outer layers into space. The star itself then slowly shrinks to form a white dwarf, while the expelled gas is slowly compressed and pushed outwards by stellar winds. As shown by its remarkably beautiful appearance, Hen 2-437 is a bipolar nebula — the material ejected by the dying star has streamed out into space to create the two icy blue lobes pictured here.